This letter is informing Capt. 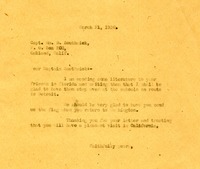 Southrick that they are sending some literature to his friends in Florida. It also expresses the gladnesses to recieve a flag from him when he gets back into Washington. Mrs. Stewart expresses her serious concern in hearing at a recent Oshkosh Chapter D.A.R meeting that Martha Berry had been hanging a confederate flag without also hanging our national flag at the Berry Schools. 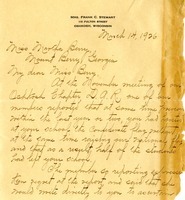 Mrs. Stewart hopes that Martha Berry will clear up this rumor and confess it to be false.